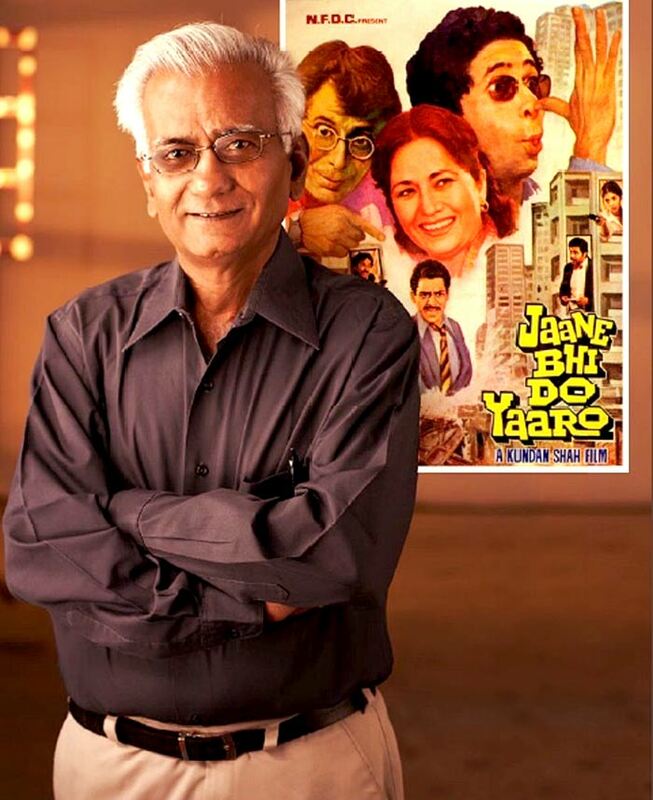 Kundan Shah talks about his most-appreciated film in his last interview. 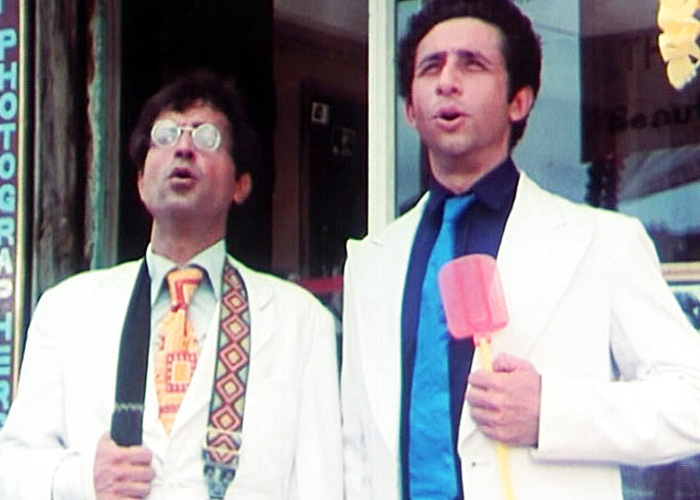 IMAGE: Ravi Baswani and Naseeruddin Shah in Jaane bhi Do Yaaro. I met Kundan Shah on the morning of May 29, 2015, the day his last film P Se PM Tak released. We were at his office in Bandra, a western Mumbai suburb. The director seemed happy and excited that his film was releasing after a long time. We started chatting about Shah's early Bollywood beginnings. But as the interview progressed -- it lasted 50 minutes -- he received five phone calls that killed his high spirits. By the end of it, Shah was in tears. The phone calls had told him that P Se PM Tak would be removed from theatres as it had got a poor opening. He could not continue the interview and I left, shaken to the core. Here was a man who had made the brilliant satire Jaane Bhi Do Yaaro. And now, his new film couldn't even enjoy a full day at the theatres. Shah passed away on October 7. He would have turned 70 this month. Patcy N/Rediff.com gives us a glimpse of that interview. I was born in Gujarat. My father was small-time businessman who exported cloth. We were seven siblings; I was the third. I did my schooling till Class VII in the Gujarati medium. I came to Mumbai at the age of 13 and joined Hansraj Morarji Public School in the English medium by mistake. It had both English and Gujarati mediums but we filled the wrong form. I was disoriented. I could not understand what the teachers said. To understand English, I started reading pulp fiction and I fell in love with it. I lived in Sion (in central Mumbai). There were no grounds to play so we would watch movies. I joined Sydenham College but was not interested in studies. (Shah receives his first phone call within 10 minutes of our meeting. He walks out to the balcony to talk. Then, he comes back and continues chatting). I graduated with 46 per cent but did not do anything for a year. One day, the secretary of my building yelled at me, asking why I was not doing anything. That struck me. My father was mostly out of house and my mom was always busy. I started looking at newspaper ads and applying for jobs. I got a job at a publishing house called Popular Prakashan as a publicity assistant. I worked there for four years. Ramdas Bhatkal was my boss. His son, Satyajit Bhatkal, has directed Satyamev Jayate. I had fun working with him. He never raised his voice. After four years, I learnt that a school friend had applied to the Film and Television Institute of India. I was shocked because he had nothing to do with the movies. I calculated the cost for the three-year course -- it was Rs 10,000 in 1973. I had that much money and my father told me do whatever I wanted. 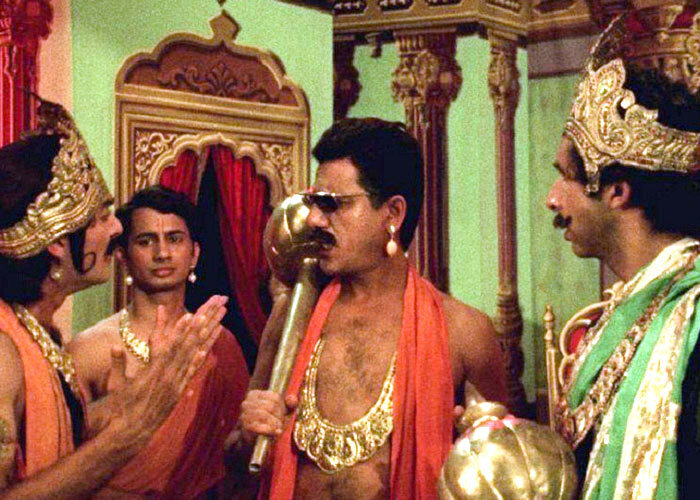 IMAGE: Om Puri and Satish Kaushik in Jaane Bhi Do Yaaro. I don't know if today is the right day to talk about this. I have just made seven to eight films in 40 years. Half the time, I didn't get my fees. In FTII, Sudhir Mishra, Vidhu Vinod Chopra and Saeed Mirza were my batchmates. Saeed Mirza was the first to make a film called Arvind Desai Ki Ajeeb Dastaan. When he was making his second film, Albert Pinto Ko Gussa Kyun Aata Hai, I became his assistant. After that, Vinod Chopra made Sazaye Maut. I became his production manager for the film. All these films were made with money given by NFDC, so there was shortage of funds. 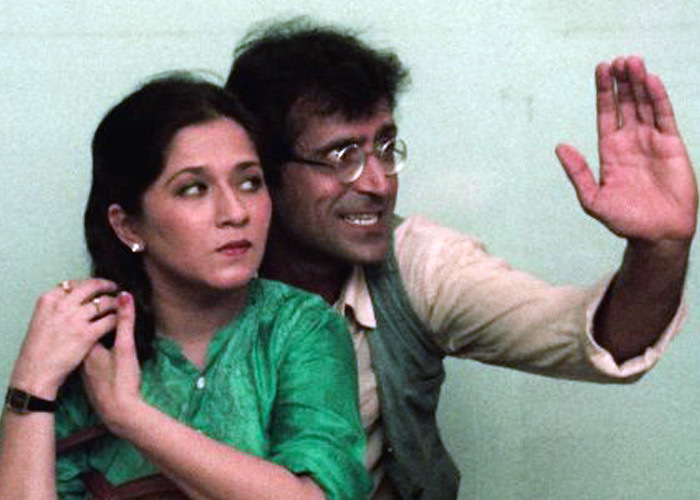 I assisted Rabindra Dharmraj in Chakra, starring Smita Patil, Naseeruddin Shah and Kulbhushan Kharbanda. Albert Pinto, Sazaye Maut and Chakra all starred Naseer. I told him I was writing a script and asked if he would be a part of the movie. He asked me for the script. After he read it, he said yes. During my second year at FTII, I understood the importance of dialogues. I made a short film, which was too literary and heavy. Girish Karnad warned me and I learnt a lesson there. It is not easy to handle actors. I was not trained how to handle stars. In my final year, I made a 20-minute silent film called Bonga. If I had not made Bonga, I would have never made Jaane Bhi Do Yaaro. When we graduated from FTII, our situation was very grim. We did not have television at that time. There was no source of income. There was no work in Mumbai, so we made a commune of editors, writers and cameramen in Hyderabad. Ten of us shifted there and stayed at the YMCA. There was no money and we would go without food. The state government gave us a budget of Rs 3,000 to make three short films and 20 of us worked on them. It's not possible to make a short film in Rs 3,000, so I gave up and returned to Mumbai. My friends Ravi Ojha and Rajendra Shore stayed back and opened a photo studio in Hyderabad. When Ravi visited me in Mumbai, I was married but my wife was not at home that day. So he stayed back. He spoke to me about his experiences in the photo studio and we laughed the whole night. The next morning, I decided to make a film on his stories. When I started writing, I added a lot of things that I faced -- the gutter water sequence was added because I was the secretary of my building. My experience and anger was put into the script. NFDC gave us Rs 6,84,000 to make the film. The cost went up to about Rs 7 lakhs, because of the posters and art work. Naseer and I got Rs 15,000 as our fees. The others got between Rs 5,000-6,000. Everyday was a nightmare. Nobody laughed during the shooting. There were fights, swearing and what not. Tempers were high but the unit and the actors stayed on and, finally, the film was made. But it was like riding a wild horse! The editing was a pain. I did not know about 'improvisation' and 'spontaneity. I was making a comedy and these are two very important factors (in a comedy). IMAGE: Bhakti Barve and Ravi Baswani in Jaane Bhi Do Yaaro. The first choice for Jaane Bhi Do Yaaro was Aparna Sen. I met her in 1982. She slept during the film's narration. After she woke up, she said yes. But, the next day, she called and said that she did not understand the script so she would not do it. We tried a lot of actresses. Finally, we went to Bhakti Barve. Her dates were full with her theatre assignments. There were just 15 days left for the shoot to start. I was praying to God when I met Bhakti. She knew our problem and agreed to do the film. She did not talk about money. IMAGE: Om Puri and Naseeruddin Shah in Jaane Bhi Do Yaaro. Naseer was shooting Katha in Pune. Twenty days before the shoot started, he asked me to come to Pune. I was worried. I told him he was perfect for the role. Naseer has said on record that he gave hell to two directors -- Mrinal Sen (Khandhar and Genesis) and me. He does not do it on purpose; he just wants to make the best film. Nobody expected it to turn out the way it did because, on the sets, it was major chaos. It was not a hit when it released. It just came and went. It released in four theatres. It ran in Mumbai for six weeks; it released in Kolkata six months later. We sold the film in Delhi and Mumbai for Rs 3,50,000 each. Tohfa (starring Jeetendra, Sridevi) released on the same day and there was no way we could have made money. Jaane Bhi Do Yaaro became popular because of the media. 'P Se PM Tak has a one in million chance to survive the box office. I think the film should get a fair chance. So the tension is major! My mind is over there. It is tough. Please write about P Se PM Tak; I need publicity for this film. Of course, we did write about it). Thank you for the laughs, Kundan Shah!